Quality 8 x 2 compact mixer Sold to a UK studio. I am highly tempted to keep this little mixer but as I don't do any recording these days it would be a waste but it is a lovely thing and sounds great. There are 8 transformer balanced inputs for Mic & Line signals, the EQ is 3 band with a swept mid and a variable frequency high pass filter, there are 2 aux sends. The channels route to the stereo bus via the channel pan pots, the Mono output is a combination of left and right outputs. The Clean-feed bus is mono, pre EQ signals are sent to it via a dedicated CF switch. The channels each have 2 sets of inserts using bantam patch sockets on the rear of the mixer, there are pre & post fader inserts, either of the insert sends may be used as channel direct outputs. There are also phantom power, phase reverse and mic/line switches on the rear along with a Fader start output. The channels, mix and Aux 1 outputs are via P&G conducted plastic, linear faders, Aux 2 and the Clean Feed outputs are via rotary pots. There is a 2 channel compressor on the master section with variable threshold, ratio, stereo link and attack/release times. The 2 channel compressor can be used on the stereo bus or patched into channels using the patch sockets on the rear of the mixer. There are outputs for 2 sets of head phones which can be switched between mono and stereo with variable levels for each, there are also separate talkback switches for each headphone send which can be very handy. The monitor outputs can be switched between the mix out put and 3 stereo machine inputs and can the led metering. 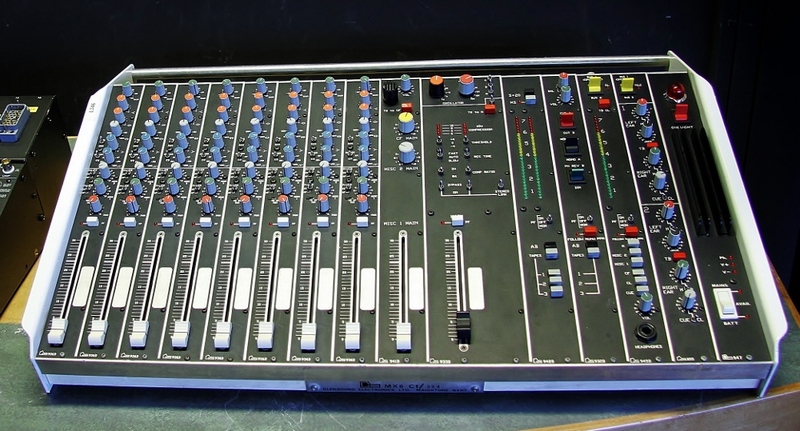 This gorgeous little mixer comes in a flight case and with a comprehensive manual. Glensound are dedicated to manufacturing high quality broadcast standard equipment - Love it !